The 81133A offers hardware-based PRBS and memory-based pattern generation. Basic test patterns for Infiniband, PCI-Express and Serial ATA can be defined. The deep 12 MBit pattern memory supports tests that require long data streams like disk drive tests. With the new PC-based Pattern Management Tool, it is now even easier to handle long patterns. The tool allows to generate, modify and store patterns on a Microsoft Windows based PC. In addition, it provides an easy-to-use function to quickly load the selected pattern to the 81133A via one of the remote control interfaces GPIB, LAN or USB. The 81133A is the ideal data and pattern source, particularly suited for eye diagram measurements. 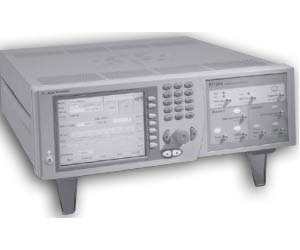 Its measurement complements are the Agilent 54850A Series Infiniium real-time oscilloscopes and the 86100C Infiniium Wide-Bandwidth DCA-J Digital Communications Analyzer sampling oscilloscope with jitter separation. Together, the 81133A and these oscilloscopes provide a complete high-speed digital stimulus/response solution.